Bill was a guest speaker at Intercessor’s Church, International Prayer Conference located in a shelter at the Source of the Nile. Four nations were represented this year. The people were camping on the grounds and praying from early morning until dark. It had been ten days of prayer and fasting which ended today. 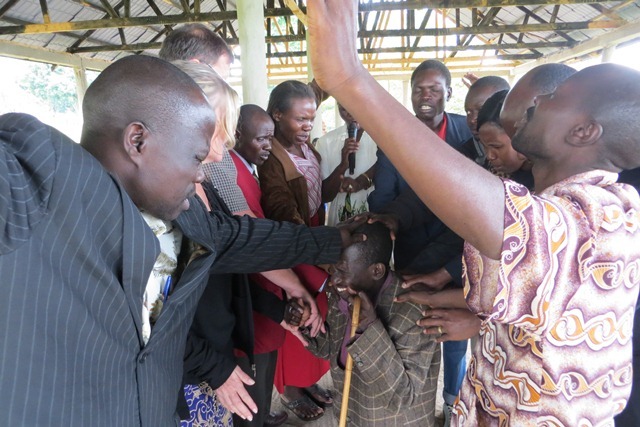 Prayer has gone up for the nation of Uganda, evangelism of the 10/40 window of Islamic nations, praying against ancestral worship, witchcraft, and every evil thing that affects Uganda. Bill spoke on the first and last day. God divinely brought an amazing group of intercessors into my life just prior to leaving for Uganda in June. One lady, Gloria waits in the presence of the Lord for the exact ingredients for special anointing oils. She prayed until God showed her the plan for His unique oil for Uganda. It was packaged in a cylinder shaped bottle with a teardrop crystal on top. In the light, the crystal reflects the seven colors of the rainbow representing the seven spirits of God. The bottle is called, “The Lighthouse of His Glory”. The Lord directed me to do a prophetic act using the oil. I told Pastor Omar of Intercessors Church that God had directed that a portion of the oil to be poured on the altar at the source of the Nile. Another portion was to be poured into the Nile River at its source. The last portion would be used by Pastor Omar in his personal times of intercession before the Lord. God said that it is time for people from Uganda; the pearl of Africa, the lighthouse to Africa; to go lay their lives down as a living sacrifice and bring the glory and presence of God to the nations of Africa. After pouring the oil on the altar; I anointed the head, hands, and feet of Pastor Omar; a once Islamic madman who wandered the streets unclothed. He declared that God had called him to go to Libya, and requested prayer. He kneeled down. The pastors gathered and sent him to Libya. The prayer time was very powerful prayer. Bill challenged the people that there is a price to laying down their lives and becoming a living sacrifice. He challenged the people about using the flesh to accomplish what only the Spirit can do; turning life in the Spirit into religious activity. Our Christian walk starts with the miracle of salvation, but without the Spirit can turn into something that man controls. The people could see themselves in the story of John 3. Hearts were deeply stirred. The fast is to be broken today with a meal of matoke, before the people leave the grounds to return to their homes. This is a beautiful lesson to me and the nation of America.